I had the recall done about a year ago, and then in a follow-up repair visist not too long thereafter, the dealer replace the fuel sending units and a bunch of other fuel system related items. I haven't smelled any fuel fumes since, but yesterday I started getting the "check your fuel cap" warning message and also have both a check engine warning light on as well as the low fuel indicator (even though the tank is full). These were the same indicators as before when I ended up getting major work done on the fuel system. I plan to pull the engine code tonight and see what's up with that. My car is just about due for it's regularly schedule service "B" at the dealer, so I'll have them sort out the fuel system pressure leak (this is what triggers the false gas cap warning message) when I take it in. Once again, I'm really glad I popped for the extended CPO warranty when I bought my car. Based on past experience, the fuel smell outside the car will be most pronounced by the filler door on the passenger side if there's a problem. Inside the car, it will just smell like gas. All of these gas fumes are reminding me of my old 1994 BMW 750iL, that was notororious for leaking gas lines at the back of the engine compartment. Lots of those cars actually caught one fire because of the gas dripping on the exhaust manifold. I personally don't think the same level of fire hazard exists with the E55, but having to deal with the leaky fuel system multiple times is not what you expect when you buy a Benz. IMHO it takes only 5 minutes to pull the seat out and open the inspection cover. Fill the car up and check as noted below for piece of mind. Last edited by 03RSTT; 08-19-2010 at 11:43 AM. Even though there is no smell of gas inside or outstide my car, do you think it is worth getting it checked anyway at my next service at the dealers? If I were you, I would not go to the stealer .. they are really really stealer, specially here in the gulf countries. Take it to the nearst Bosch services center " central or eastern or western motors (according to your area) "
You are #6 from just this forum with the same failure. PM sent. I would like you to call the same field rep that I'm dealing with at MB USA. So far 4 of us are calling her with the exact same story. By chance? I dont think so. MB USA you have a problem and it leaves us the owners holding the bomb literally. very slight leak...recall done and pump changed 8k ago no problem since. Picked up the car tonight. 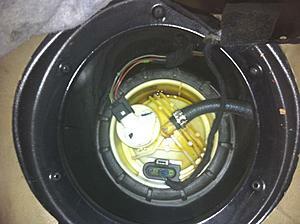 MB Chandler did a fine job with the car and proactively replaced both fuel level sensors. My wife didnt want to drive her car home (40mi) so I drove it and she followed in the LX470. Still love the E55 and the way it drives. I hope we can fix this problem and keep this car but can I tell you guys something? Some humor on a thur nite. Problems all over the place. Another owner that has gone thru two sending unit assemblies. My car had the same issue, Recall performed. Six months ago fuel smell, pools of fuel in the sender basket, Thanks to the Chrysler Extended warranty the ~$1000 repair is paid for. Ours was covered by extended warranty as well. But, what does that say about the "fix" and how do you feel about fuel leaking above hot exhaust pipes? Clearly there is an unresolved problem with the design. The next owner may not be so lucky and escape. How should we all fell about that? How will you feel if a burning E55 is on CNN tomorrow? I have notified this forum. I have called NHTSA and reported a full case. I have called MB USA and advised them of a serious problem. I have called and emailed the local Phoenix news stations. This is the best I can do. If all these folks choose not to deal with the problem and a burning E55 ends up on CNN. It will not be pretty. I could care less about a few hundred dollars. A safety issue gone unresolved has my attention. This E55 was our first MB. My wife has drove Lexus (SC400,LS400,LX470) for 15 years. If this is how AMG customers are treated....good luck folks. There will be no SL63 or Eclass convert in our future. If and when my RS6 needs serious attention I have the direct line to the RS6 master engineer in MI. Its not rocket science. Educated owners will spread the news good or bad. Last edited by 03RSTT; 08-21-2010 at 07:03 PM. My first post as a new member and owner of a E55. 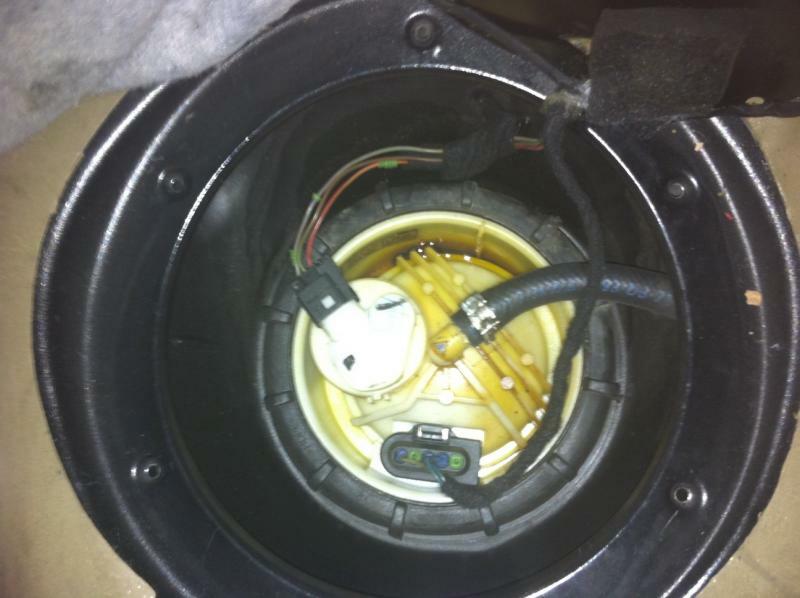 I too have a leaking seal on the fuel level sender as shown on the photos posted. Thanks to the forum and quality posts (like this) I have an opportunity to keep my family safe by repairing this safety issue. I work in the aviation profession and we have zero tolerance for items we call "safety of flight"; this is one of those type items for all owners. Pay heed to this...check it yourself then go to the dealer and get it fixed. No amount of money or "I am deeply sorry for your loss" will bring back a loved one or put skin and hair on your son, daughter or wife...much less each of us! I sincerely appreciate this post and the concern and care given to each of the members to ensure our safety. Exactly why I did what I did. My car had the recall service completed and the seal leaked a year and half later. The seal was replaced under warranty again. The dealer blamed it on a bad installation. Just as Bonai Kid noted above. 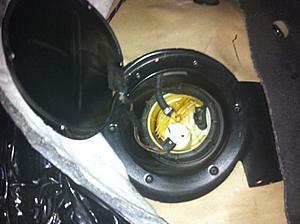 "Pay heed to this...check it yourself then go to the dealer and get it fixed. No amount of money or "I am deeply sorry for your loss" will bring back a loved one or put skin and hair on your son, daughter or wife...much less each of us!" Do you think anyone else cares about you and your family safety? I mean really cares enough to do something? Our car has the recall completed at 52k miles. We started smelling gas on fill ups around 60k and finally found another leak at 61k. The seals on the component were changed at 61k. Dealer said the same thing you were told...its fine and these things happen. Dont worry. Then at 65k without no notice all hell broke loose and we had gas pouring out from the sending unit pictured. 3k miles after I was told "its fine dont worry about it"
Sound like anything you were told? Update on the Leaking Fuel Filter Assy. Ok guys...here is another leaking Fuel Filter Assy.. Notice the dark fuel sludge...this condition is very serious. I am not a smoker but if I was or if I had passengers enter the vehicle this afternoon after having it sit in the sun with a full tank there were such heavy fumes one might be concerned about ignition from spark or cigarrette. Please take heed. If you smell gas...check it. It takes only minutes. The quality of the maintenance access seal and the torque on the bolts on the panel can mask the seriousness of the leak and the amount of fuel that has leaked. The gas clearly has seaped during the day out the bottom of the maintenance panel and soaked the insulation bad to the point that the black plastic on the seat cushion side is now gummy and ruined. This is serious. See photos. As I noted above. Bingo we have another winner. Tick, tick, tick....do you MB owners with E55s have car bombs too? I think its time for legal help in this matter. Holy smokes!!!! I need to check my car. Had my recall done last year. THANKS FOR THE THREAD AND POSTS!!! The time needed to repeat the leak seems to run between 14-18 months. Follow the procedure to check the seal.